From our Academic Integrity policy to the Withdrawal Policy. This is where you will find the details about our standards and policies. Early each term, students whose grades in the previous grading period indicate outstanding achievement are recognized in the Dean’s List. Full-time students (those enrolled in 12 or more credits) who earned 12 credits in the preceding term (not including courses taken on the Satisfactory/No Credit option) with a term GPA of at least 3.5 and no grade lower than a C are placed on the Dean’s List. Part-time students (those enrolled in fewer than 12 credits) who earned 12 credits in previous terms (not including courses taken on the Satisfactory/No Credit option) with a GPA of at least 3.50 and no grade lower than a C are placed on the Dean’s List. Part-time students are evaluated for Dean’s List recognition by determining if 12 credits on the letter-grade system have been completed since the last Dean’s List recognition. If 12 credits have been completed, the GPA for the terms in which the last 12 credits were completed is used to assess Dean’s List eligibility. 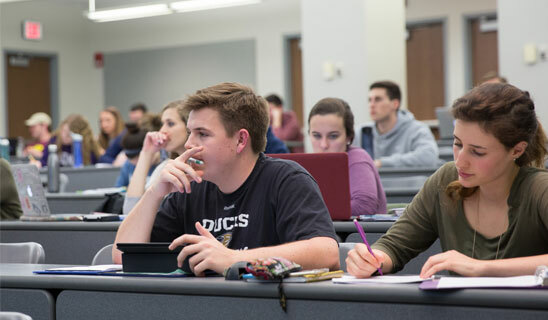 Students remain in good academic standing as long as they maintain a cumulative grade point average (GPA) of 2.0 in all courses taken at the University of Pittsburgh. The cumulative GPA includes all courses taken on a letter-grade basis at all campuses of the University of Pittsburgh (as well as “college in high school” courses taken through the University of Pittsburgh). Any student who has a cumulative GPA below 2.0 at the end of the fall or spring semester is placed on academic probation. Notice of probation is emailed to the student’s University of Pittsburgh email address. Full-Time Students: If after one term of additional enrollment, the cumulative GPA of a full-time student on probation remains below 2.0, the student is subject to suspension or dismissal. Students on probation who enroll and then withdraw from all courses are still subject to suspension for not raising their cumulative GPA to 2.0 after an additional term of enrollment. Part-Time Students: If after attempting 12 additional credits, the cumulative GPA of a part-time student on probation remains below 2.0, the student is subject to suspension or dismissal. An academic suspension from CBA prohibits students from enrolling in courses at the University of Pittsburgh for one calendar year. Students will not be awarded transfer credit for courses taken at other colleges or universities while on academic probation or suspension. Near the end of the calendar year suspension, suspended students are eligible to apply for reinstatement to Pitt Business with a letter to the Director of Pitt Business Advising presenting a rationale for reinstatement. Reinstated students return on academic probation and have one term of enrollment to raise their cumulative GPA to 2.0 or be subject to a second suspension or dismissal. If suspended a second time, a student is not eligible for reinstatement for five years. After five years, suspended students are eligible to apply for reinstatement to the Pitt Business with a letter to the Pitt Business associate dean presenting a rationale for reinstatement. Dismissal from Pitt Business is a permanent action, and dismissed students are not eligible for reinstatement. A cumulative grade point average (GPA) of 2.0 is required in all courses applied toward the BSBA degree. A cumulative GPA of 2.25 (C+ average) is required in all courses applied toward a student’s major. A C- or better must be earned in each course applied toward a student’s major. Business courses must be taken on a letter-grade basis. In addition, courses taken to fulfill the requirements in microeconomics, macroeconomics, calculus, and statistics must also be taken on a letter-grade basis. Language classes, arts and sciences courses, and electives may be taken on a satisfactory/no-credit grade basis. Under the satisfactory/no credit grade option, a student who does satisfactory work (C or better) receives the grade of “S” for the course and earns credit for the course. If a student does unsatisfactory work (defined as C- or lower), the student receives the grade of “NC” and does not earn credit for the course. Once a student selects the satisfactory/no credit grade option, the option cannot be reverted back to a letter-grade. Students may withdraw from arts and sciences and/or business courses. The withdrawal deadline for arts and sciences and business courses is the same; students should refer to the academic calendar to determine the withdrawal deadline for each term/session. Withdrawal requests will not be processed after the withdrawal deadline. Withdrawal forms are available in the Tafel Center for Student Success (2nd Floor, Sennott Square). Business students seeking to withdraw from arts and sciences courses are responsible for taking the completed withdrawal form to 140 Thackeray Hall before the deadline for processing. Business students seeking to withdraw from business classes are responsible for taking the completed withdrawal form to the Pitt Business Associate Dean’s office (2204, Sennott Square) before the deadline for processing. Students do not earn credit or receive tuition refunds for courses from which they withdraw. Students should discuss the implications of withdrawal with their Pitt Business academic advisor before electing to withdraw from a course. Students who receive financial aid should also discuss the implications of withdrawal – including “satisfactory academic progress”- with a representative of the Office of Admissions & Financial Aid in Alumni Hall. This policy applies to all courses offered by the Pitt Business. A “G” grade may be assigned at the option of the instructor during the last month of the term to students who have been making regular progress, but are unable to complete the work of the course by the end of the term due to extenuating personal circumstances. An “I” grade may be assigned to students who are unable to complete an internship or independent study due to the unique requirements or circumstances of the course. A course must be completed with the same instructor assigning the “G” or “I” grade by an agreed-upon deadline (usually within one month, but not later than one year from the end of the term). If the remaining work is not completed by the deadline, the instructor will submit a letter grade based on the work submitted by the deadline. The student and instructor should complete the form and submit it to the Pitt Business Office of the Dean, 2505 Sennott Square, at least one day before grades are due at the end of the term. The Pitt Business Guidelines on Academic Integrity are applicable to students enrolled in Pitt Business, students taking courses offered by Pitt Business, faculty teaching courses in Pitt Business, and senior administrators of Pitt Business and the University. It is very important that all students and faculty are familiar with these guidelines and follow them. Please contact the associate dean of Pitt Business with questions or comments about the Pitt Business Academic Integrity Guidelines. A Pitt Business student may repeat a required Arts & Sciences course (including calculus, statistics, microeconomics, macroeconomics and composition), a business core requirement and/or a business major requirement once. If the minimal acceptable grade is not earned after repeating the course, the student may have to transfer out of Pitt Business, or select a different business major. In the calculation of the major and overall grade point averages, the grade earned in the second taking of a course replaces the grade earned in the first taking; however, the grade earned in the first taking of the course, remains on the student’s transcript with a notation indicating the course was repeated.